You can expect to find big specimens during mullet run time, like this beauty in excess of 20kg! CHASING landbased lure crunching mulloway becomes easier when you understand what they eat, and as Patrick Linehan explains, the mullet run is where the action happens. THE sight and sound of a 60lb mulloway “boofing” sea mullet at night is a scene I’d fail to portray through descriptive writing. It’s one of those moments you observe in nature you wish was caught on film, with David Attenborough’s narration! Unfortunately it’s usually too dark for cameras and I’m not sure Sir Attenborough likes fishing all that much. Nevertheless, mulloway are always worth talking about and there’s something most anglers find very intriguing about them. Big mulloway are a highly enigmatic species and it may take even the most experienced angler years of research and perseverance to consistently catch them. I’m no exception to the rule and over the years I’ve put in my fair share of time (and money) chasing big “ghostly” mulloway on lures, but after less than impressive results I concentrated my efforts elsewhere. However, a few mates of mine persisted and Kieran Hill, Duncan Crockett and Nathan Debono have been catching (and releasing) trophy land-based mulloway regularly over the past couple of years. For these guys, it just seems far too easy! After constantly hearing and seeing the fish they’ve been catching, I was eager to join this crack team of “silver ghost” busters once again and reignite the big-jewie-on-lure flame. 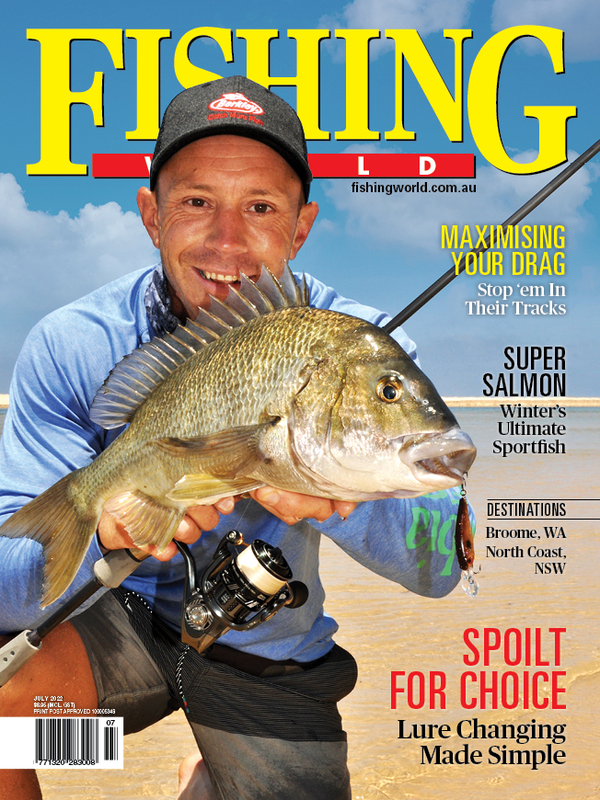 Now, after a fresh look at the big (mulloway) picture while fishing alongside some of the best jewie-luring fishos, one thing is clear to me; if you’re after big mulloway on lures, fishing around the schools of spawning sea mullet during cold winter nights is a sure-fire way of increasing your chances! A school of sea mullet heading north around a prominent headland. The common sea mullet or “bully” mullet occur around much of Australia’s coastline and are a staple prey for big river dwelling predators such as bull sharks and of course, mulloway. Sea mullet are found primarily in estuaries and inshore waters, although they also occur in the freshwater reaches of coastal rivers. From late summer, adult sea mullet will begin to meander from the freshwater reaches of coastal rivers down to the lower tidal estuaries. Eventually, these big mullet school en masse along beaches, headlands and around the entrances of river systems, harbours and inlets. The spawning of sea mullet occurs at sea (hence “sea” mullet) from autumn to early spring. This is the time when commercial fishermen target various spawning fish species by beach hauling. Large nets are used to encircle vast schools of fish and drag them onto the beach, in this case big mullet, as they move northward along the coast. Subsequently, predators such as mulloway are generally close by stalking the mullet, and also in large schools, which are quite often netted from the beach in a very similar fashion. Other fish species along with sharks, skates and rays can also be unintentionally caught in these large nets as they too will quite often feed on the scraps of the annual sea mullet migration. These hauls can be hard to watch for passionate recreational catch and release anglers! Typically, sea mullet will be about two years-old (20cm+) before they begin to spawn and this gives a good indication of the size of the mulloway that feed on them. Generally, you should expect to encounter mulloway from around 10kg+ when focussing your efforts around schools of spawning sea mullet. I can honestly say we haven’t caught a mulloway under 10kg this sea mullet season, and the “silver ghost” busters usually scoff at anything sub 15kg! Keen “silver ghost buster” Kieran Hill with a 145cm (25kg+) mulloway caught on a Killalure Jewie 150. Find the mullet, find the mulloway! As schools of spawning mullet will be heading downstream during early autumn, the biggest mulloway in coastal river systems are most likely to be concentrated in back eddies and deep holes utilising their finely tuned sensory armament to ambush unsuspecting prey during low light periods. Sharp bends, rockbars, bridge pylons and forks in the river are good starting points to focus your efforts further upstream. All of these natural and manmade features create back eddies in the tidal current and allow big fish to exert little energy when feeding. Sounding around from a boat or using the Navionics mobile app to look for drop-offs and holes that create breaks in the current, which aren’t visible from the water's surface, also pays dividends. This way you’ll know where to target your casts at night. And it’s why having a good understanding of your local system can save a lot of groundwork! Moving on through to mid autumn, the bulk of the mullet run will be closer to the openings of rivers, harbours and inlets. This is a good time to target nearby structure such as wharfs, drop-offs, wrecks and rockbars. As mentioned previously, big mulloway will be using these features to shelter from tidal currents and “boof” surface schooling mullet being swept overhead. Once you have a few likely places to start fishing, we can then further concentrate effort to favourable tide and moon phases. But, when it comes to the new or full moon, I’m happy to sit on the fence. Like most trending mulloway theorists, I’ve witnessed that the moon phase doesn’t matter all that much, especially when fishing around the mullet run! Which makes sense as I can’t see why a big mulloway would pass up an easy meal if the conditions will allow it. However, the peaks of either moon phase (where there is more tidal movement) seem to be when most of the activity occurs. Therefore, late autumn and winter is the perfect time to intercept big mulloway because the peak of the high tide occurs well into the night on the lead-up of both the new and full moon. It’s important to remember by the time a mulloway has reached 15kg it is a cautious, commanding low-light hunter that relies on the darkness to hunt less conspicuously, using as little energy as possible to feed. It’s likely that once spawning sea mullet begin spilling out into the ocean, big schools of mulloway from offshore reefs head inshore and capitalise on the seasonal occurrence. Ocean breakwalls and nearby headlands with prominent points and washy fingers are perfect spots to target big mulloway off the rocks as the fish wait patiently in ambush. Deep gutters (which are further pronounced at night due to the big tides) in the corners of beaches and along the beach-side of breakwalls are also prime big jewie haunts. This is especially true on the northern side of the river system’s entrance. It’s important to match the side and profile of the bait, which in most cases can be quite large. Before getting to lures, it’s crucial to get the basics right if you are to stand a chance of landing a 20kg+ mulloway at night. Firstly, a good quality head torch is a must. Head torches are an important bit of kit when it comes to clambering over rocks in the dark, walking through the bush and (hopefully) steering a mulloway to a designated landing point. However, a degree of stealth is advised and try to keep the torch off the water when fishing. Typically, we’ll only have it on when we’re walking in and out of a location and when a fish is nearing the rocks - just before netting or washing up. Generally, there is ample light to fish without the aid of a head torch around the full moon, but you’ll still need it to tie knots and change lures as required. Secondly, a pair of shoes that are able to be worn in and out of the water are a valuable asset when fishing regularly from low lying banks, beaches and breakwalls. Keen and Teva are two brands worth looking into, and they make several good quality designs of grippy, comfortable and amphibious shoes - particularly important if you plan on releasing fish. When it comes to fishing gear, a good quality spinning reel with a smooth powerful drag that holds 300m of 30-50lb braid will be enough to stop just about any mulloway you’re likely to encounter. I’ve recently been experimenting with incredibly powerful yet small overheads and baitcasters casting lures off the rocks for longtail tuna and Spanish mackerel, so I’ve been using these while luring for mulloway, too. It’s similar to a setup you would use for big barra or black bass but with a longer rod which is more suited to landbased fishing. Keiran Hill releases another jewfish and with two powerful kicks of the tail it disappears into the night. Pairing your reel to a strong graphite or glass composite rod around 9 feet in length (depending on the location you fish) is perfect for this type of fishing. Most big mulloway lures are between 40-100 grams and you’ll need to cast these repeatedly in the dark, so find a balance between overall power and lightness to make casting easier. Generally, 40-80lb fluorocarbon or hard nylon leader will cover most situations. As big jewies can be hard work around the rocks, keep your leader at least 3m in length, but not too long as this can dull the action of some diving hardbodies when slow rolling them just beneath the surface of the water. The enticing action of a slow rolling hard body is crucial in drawing a mulloway away from a school of mullet and convincing it to strike. Typically, the best lures when fishing around schools of big mullet will be those that replicate the silhouette and action of one. Lures like the Killalure Jewie 150, and the old River2Sea Lively Mullet (bibbed soft plastic/hard body) are favourites. Croaker Lures, Leavey Lures and Ando Lures out of Yamba have also been making some great timber mulloway lures which have all accounted for some trophy mulloway more recently. However, most large mullet profile lures that can be worked slowly and swim no more than 3ft deep will work when used around schools of spawning sea mullet. Big trebles are favoured over single hooks for mulloway, which can be at times fairly inaccurate when striking a lure. Interestingly, quite often you’ll have a better hook-up rate on the full moon. As evolved to feeding in the dark and dirty water as big mulloway are, they tend to be far more accurate with their strikes when there is some sort of light either from the moon or from close by artificial lighting. It’s clear to see, the quest for a big mulloway on a lure is not an easy one. And there are many more facets which cannot be covered in this article alone. But rest assured, big mulloway are not uncommon and you can never be too sure when you’ll be likely to encounter one. The beauty of this method is, you can apply it to just about anywhere that mullet and mulloway occur and have access to the ocean. Chances are that if you put in enough casts in the right places, it’s only a matter of time before you feel that almighty crunch on your lure!